De Buyer's Force Blue country frying pan is an unmatched utensil for searing, sauting, and browning. Crafted with blued iron, a unique iron coated with a special surface thermal treatment to protect against oxidization, this pan can reach exceptionally high temperatures allowing for the delicious caramelization of its contents. 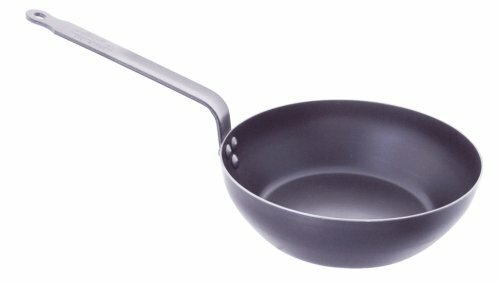 The unique blued iron possesses naturally non-stick properties and seasons gradually with use, preserving flavor and enhancing all future creations. Due to its sturdy iron construction, this pan is undeformable and will last through extensive use. With an unbreakable, riveted iron handle, the country fry pan is simple and sturdy to handle, guaranteeing no mess or mishaps in the kitchen. Measuring 24 cm across, this pan can be used to craft large multi-portion meals, and a variety of other treats easily and with a minimal number of dishes.